My friends, in today's world, I wonder if you understand the difference between the True Church of God, and I mean the Church that Jesus Christ said that He would build. You know, Jesus Christ said, "I will build My Church." Where is that Church? Which of all these churches that you see, of all these many denominations, which could be that Church? I want to tell you when you find that Church as you find it described in the Bible, as you find it in the beginning of the New Testament, there is one thing that differentiates that Church from all other churches. Now, listen carefully, here it is and you can tell by this whether you belong to that Church or not. The Church that Jesus Christ is the living head of, the Church that Jesus Christ built as He said He would build, the Church that He said, "The gates of Hell should never prevail against," is a Church that is under the authority of Jesus Christ and under the authority of God Almighty as the Supreme Creator Ruler of this universe. I wonder if you realize to what an extent people have come to seem to have assume today that God may have created once upon a time way back there in the long, long ago, but that God had gone way off somewhere, He's busy elsewhere now, He's not concerned about us, He's not concerned about the world, we can just do as we please, and it'll be alright. Or else, people look on God as some kind of a stern monster that gets great pleasure out of our misery and our unhappiness. And so we must give up every pleasure and everything that's worthwhile in life in order to please God. I remember years ago, I was talking to the wife of a lawyer, an attorney, up in Vancouver, Washington it was. As a matter of fact, I was making a survey of conditions up there. I don't remember just who this woman was; she might even be listening to this program now. She was the wife of an attorney. I was making a survey of business conditions — that was before I was even in the ministry. It was quite a while ago. And this woman said to me that...she brought up the question of church and religion in some manner or other, I don't remember just the connection now. It just comes to my mind all of a sudden, but anyway she said, "Well, most churches say that it is a sin to dance or to go to movies or to play cards or to do things like that. Well, my goodness," she said, "If I didn't do those things, what on earth would there be to live for?" And she just didn't go to church for that reason. Well, now, a lot of people actually picture God as a stern harsh God that derives great pleasure out of seeing men suffer. That God likes to make us do penance, in order that He may enjoy our misery. Now, I wonder if you know where all of that originated. It actually originated in paganism because the ancient pagans, my friends, believed that they could secure what we may designate by the term justification that they could be justified by doing penance, or by forcing themselves to go through certain painful procedures. Like for instance, they might have long plank, a long wide board about let's say ten or twelve feet (at least) long with nails driven all the way through it and sticking up and with the nails on the upper side and people would have to walk barefoot over those nails protruding up from the board, the entire length of it. Perhaps the nails would pierce through their feet and they would come out at the other end all bleeding and in a terrible, horrible condition. And the pagans used to do things like that, many other things, that's just an example that comes to my mind. They would do things like that and somehow they thought that pleased their gods and that would forgive their past sins. Now, in the first place, let me just mention that justification does not mean salvation. Justification has nothing to do, directly that is, with the gift of eternal life or actual salvation for eternity, it has only to do with getting rid of a guilty past. Justification has not a direct relation to the future but only to the past. Now, I say direct because in the real true understanding when you have it, it does have a connection because it clears the way for the future but it doesn't give you that future, that is another thing altogether. Now, we are justified, if you understand it, only by the blood of Jesus Christ. And only the blood of Christ can take away your past guilt. I wonder if you understand that in the days of Jesus Christ, nineteen hundred years ago, that the Jews had looked on the pagans, they had seen how the pagans got justification by doing penance and by performing these things that punished them and brought on a great deal of torture and pain upon themselves and they figured that that pleased their gods and that then their gods would forgive their past. Well, the Jews had begun in those days to copy the pagans (more or less that is in different ways) and so they adopted the principle of doing penance, but not the actual practice. In other words, they didn't walk over a board full of spikes and nails, but what they did, they took the ritualistic laws that God had given them through Moses, in the days of Moses, the meat and drink offerings, the carnal ordinances, the animal sacrifices for sin, the constant round of rituals of physical hard work that God had given them to do which God had given them because in those days they did not have the Holy Spirit of God or any direct promise at that time of salvation, whatsoever. You can't find it back in the Old Testament, except in prophecy for the future. But you cannot find where it was ever offered to Israel of old — they just did not have it. Consequently, the only way they could keep the Law of God was according to the strict letter, not according to the principle or the Spirit. And so God gave them these rituals to do. They were physical rites, physical activities, hard labor, actual physical work, material things to do to teach them the habit of obedience as a schoolmaster to bring them to the time of Christ after which when Christ had once done away with our sins and we could have the Holy Spirit which came after Christ ascended to Heaven, then we could have the Spirit of God and could really have the Love of God shed abroad in our hearts which is the Love that fulfills the Law. Well, they didn't have it of old. They only had the rituals. And they were for a purpose and a very good purpose. They came from God and God has never done anything wrong. God has never done anything contrary to our interests. Even those rituals were not contrary to their interests but you know the Jews at that time had got to gripping and grumbling as they always have done. Even the ancient Israelites coming out of Egypt under Moses, grumbled continually — they gripped, they complained, they grumbled. And so after the days of Ezra and Nehemiah, they continued to do it. And so, they began to look on God as a harsh God. They began to get the same attitude toward the true God that the pagans had toward their heathen gods and they looked on God as One that was punishing them with those things and so they began to look on these rituals, these material ceremonies and physical works to be performed under the Law of Moses as penance. And so they looked on it and began to teach by the time of Christ that you could be forgiven your past guilt and your past sins by working out your own retribution by doing these things. Now, that's what the Apostle Paul ran into. He ran into a case where even among the Gentiles, when people were converted to Christianity, Jews who were not Christian or Jews who were Judaizing had come to them and told them, "Now, you must do penance. You must get rid of your past guilt, not by the blood of Christ, but by doing these physical works of ritualism that you can be justified and get rid of it. "; in other words, applying the whole heathen, pagan idea. That's exactly what they've been doing it ever since to Christianity if you can understand it. Taking pagan principles, pagan philosophies, pagan things and rituals and deeds and putting them into Christian practice so called and calling it by a Christian name. It isn't Christian. They merely call a lot of things by that name. It has no relation to the spiritual principles of the way of life that God gave us — the Ten Commandments. The Ten Commandments are spiritual principles and they cover the entire duty of man — the entire way of life — a life of peace! But because people think that God was capable of making only one Law and that one Law was the Law of Moses and because they think that the Spiritual Law of God was a part of the physical rituals of Moses they take the writings of Paul and they say well He did away with all works. Consequently, there is no obedience. Consequently, we don't need to obey God. We can thumb our nose to Him, God's gone way off and doesn't care about us or else God merely gave us a Law and saddled one on us to make us miserable and unhappy and to torture us so that God gets a lot of pleasure out of seeing us undergo pain and suffering and torture. And so, that teaching was going around at that time. Now, I want you to understand this, my friends. What is called Judaism and Judaizing in the New Testament is not the Law of Moses, is not the religion that God gave the children of Israel through Moses but is a perversion of it and a taking of a law of Moses, the ritualistic law, the material law of material physical duties and looking on that like the pagans did and copying the heathen pagan principle of penance and looking on it as a means of doing penance to get rid of your past guilt and your past sins. And that's why Paul said you cannot be justified, that is forgiven your past guilt by the works of the Law, of course you can't. You can't even be justified or forgiven your past guilt by keeping the Spiritual Law of the Ten Commandments now and you cannot keep the Spiritual Law of yourself. It requires the Spiritual Love of God shed abroad in your hears by the Holy Spirit which only God can give you in order to fulfill that Law. But unless you fulfill that Law, my friends, you can never be saved. 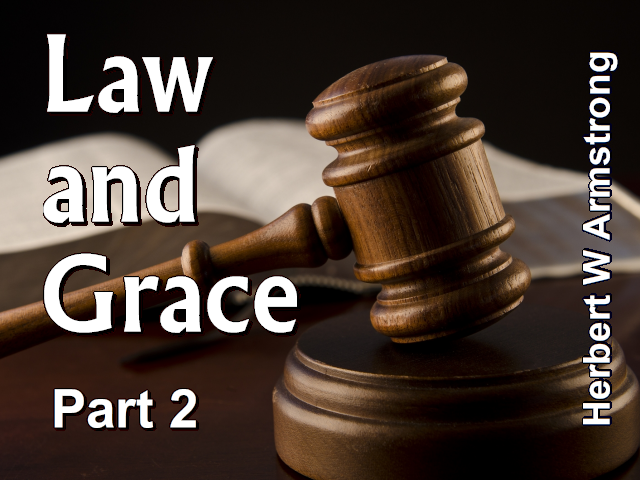 And you can't fulfill that Law until you have had your guilty past wiped out by the blood of Jesus Christ and until you have received the Holy Spirit of God and been begotten as a child of God, then you can keep the Spiritual Law of God which is a Law of Spiritual principles. Now, people don't understand that today. You know Jesus said, as you find recorded back here in the fourth chapter of John's Gospel, that God is a Spirit — God is a Spirit. He was talking to this woman at the well of Samaria, said, "You worship you know not what." and that is true not only of some pagans or Gentiles like that woman was then, it's true of our people today. He said, "We know what we worship." Now, He said, "God is a Spirit and they that worship Him must worship Him must worship Him in Spirit and in Truth." My friends, do you realize you cannot do that unless or until you receive the Spirit of God within you. The very Mind, the very Spirit of God, it's a new changed attitude, it's a new outlook on life altogether, something that is not natural, something that you were not born with, something that can be implanted and transplanted within your mind by and only by the Holy Spirit of God. And until you receive that and come to have a new concept of life and of everything till all things become new and old things are old and the things you once loved you don't care for any more and the things that once were foolishness to you and rather silly and foolish to the carnal mind now assume an atmosphere of very great importance. You come to see things as they are. You come to have sound understanding because the Holy Spirit is the Spirit of a sound mind and it is the changing of our minds and the rebuilding of our minds and when you come to have that mind, the mind of Christ, that Spirit, that attitude of Christ, that Love of God in your heart, then you can worship God in Spirit and in Truth and you realize that you are worshipping the invisible God that you have never seen. But men cannot do that. Men must worship something that is material. And do you know what they are doing in this world, and they have always done it. You go back in the history of ancient Israel; you find it all the way through their history in the Old Testament of your Bible. You find it in today's custom and practice, you find it in your churches today — people are worshipping either men or things. You find it in all the pagan religions; you find it in what we call "Christianity." Actually, people think they're worshipping God but they can't see God and their real affection, their real worship goes out to that which they can see — something material — a material man or a material thing. That is why the heathen have always worshipped idols carved out of wood or stone or ivory or marble or something material. They have always wanted to worship something they could see. Now, you don't realize that, my friends, I know most of you don't, but people today often worship men. Do you know what worship really is? They're following men today. You go back to ancient Israel and the history of the Old Testament and you'll find that whoever was the king of Israel or of Judah at the time, if he, for instance, introduced some form of idolatry or some of the pagan customs, all the people fell in line, just like sheep, like dumb sheep that they are, they fell in line, they did whatever the king set. Or if the king did away with those things, if he cast them out and all of their objects of pagan worship and kicked them out of the temple and out of Jerusalem and if he reestablished the worship of the invisible God, well, they'd follow him as far as they were able. They never knew how to really worship the true God, however. But the people would do whatever the man leader said and people today do it. Now, Paul said to the Corinthians, he said that there were divisions among them and one of you says that I am of Paul, another wanted to be a follower of Apollos and another wanted to be a follower of Peter or Cephas and another wanted to follow Christ. He says, "Is Christ divided?" Now, today we have our various sectarian denominations. And one is suppose to be follower of one man and another of another man. I won't mention the names because I don't want to cast reflection on any one or any organization, but I want to get the principle and the truth out to you so that you really understand it. So, what are the differences? Now, what do we have in our sectarian denominations? They are the followers of a man in nearly every case. And whatever the man that started the denomination or the sect or the religious organization, whatever he took as doctrine, whatever he set as the doctrine to be practiced, his followers took it, they put a frame around it and they refused to accept anything more or less. They refused to ever acknowledge that there was any error whatsoever. And there is not a one of those that has not had error. And when the error was exposed, the followers of that church, that denomination had built up an ecclesiastical organization and they could not for political reasons admit any error in what they taught. That doctrine has been the test of fellowship in nearly every case; perhaps not in every denomination but certainly in most of them. And so, if you don't believe just what is set, you can't belong. You're expected to believe it, swallow it hook, line and sinker, true or false. When new light is revealed and we find that the prophecies were closed until the time of the end. We're in that time now and have only entered it in this 20th century A.D. Now, most church denominations were founded before that time. But, my friends, you will find that now that the prophecies are opened up and about one third of all the Bible is prophecy and they could not be understood until now, you will find that there is not one church sect, not one church denomination that has admitted it was teaching the prophecies incorrectly and that it was in error and not one has ever dared to come out and publicly expose its own error and confess it and repent of it and change around and accept the truth, now that the truth is available. And God had closed this truth of the prophecies until now, until our time. Oh, I tell you it's time for some voice to cry out and to expose these things and to wake you people up and to show you the Truth of God that somehow you haven't had! We've been blindly following wherever other people go. We've been concerned what will people think and many of you that hear me. And you find that the errors of the time are turned clear around until we get right side up and get the Truth. And you find it's different from anything that you ever heard before and many of you are afraid of it. You know why? Because you say, "But what would my church people think; and what would other people think?" Can those people save you my friends? Can they impart eternal life to you? You're going to stand before Jesus Christ in the Judgment some of these days and then what are you going to think? Then who are you going to be concerned about and whether what your friends think counts or whether what God thinks about you counts. Now, you see, they took the rituals of the Law of Moses and they looked on those as hard painful duties and they looked on them as doing penance and they tried to claim that you ought to do it, those Judaizers, in order to be saved, in order that you could have your past sins remitted. Well, Paul naturally taught against it. But, Paul nowhere taught against the Ten Commandments. The only thing that Paul ever tried to do was to show them that you could not receive remission of your past sins by earning or working out your own way and doing penance — that is all that Paul did. As a matter of fact, Paul himself observed not only the Ten Commandments but much of even the rituals of the Law of Moses. Now, I don't mean all of them but some of them he did. And Paul, actually bought animals to be sacrificed for those who were under the vow of a Nazarite under the Old Testament or the Mosaic Nazarite vow, Paul actually took money of his own to purchase the animals to be sacrificed by those Nazarites because they didn't have the money. And he did that on the advice of James who was the chief elder, we might say, the presiding or the top pastor of the Church at Jerusalem, the Church that all the Gentile churches appealed to for the Truth in those days, the Church that was the original mother Church and which was the headquarters church that decided Gospel doctrine under the authority and the Power of the Holy Spirit. And the very pastor of that church had prevailed on Paul to do that very thing, in order to show that he was not teaching against the Law of Moses. You know, you've had a rather wrong picture of some of Paul's teaching. They take a little bit of it here and little there out of their context and they don't tell you what the works of the Law mean. Now, there is no place, my friends, absolutely no place in the Bible that you can find that word or that expression of three words — "works of the Law" — it's four words I guess. There is no place in the Bible that you can find those connected with the...that is or representing, referring to the Ten Commandments. The Ten Commandments are not the works of the Law. The word "works of the Law" always refers to physical works because it's translated from the Greek word ergon which means physical, manual labor. And the Ten Commandments do not represent a matter of physical manual labor but a matter of spiritual principle. It doesn't take physical manual labor to avoid having other gods before the true God and to worship Him and Him alone. It doesn't take physical manual labor, my friends, to avoid worshipping idols and worship the true God only. It doesn't take physical manual labor to avoid taking His name in vain, to revere His name and to honor it. It doesn't take physical manual labor to rest on the Sabbath day...from physical manual labor but just exactly the opposite. It doesn't take physical manual labor to honor your parents or to love your neighbor instead of killing him or to be faithful and true to your wife or your husband instead of committing adultery or to be honest instead of stealing or to refrain from coveting what another has. Does that take physical manual labor? No, those are spiritual principles every one of them and they have to do with your relationship to God and your relationship to your neighbor. But you know in the Law of Moses they had a lot of rituals — things to do morning, noon and night that were physical duties. Well, you see my friends, in those days the Judaizing teachers...and incidentally, as I said before, remember that Judaism is not the religion of Moses but the religion of the Jews in the time of Christ who had perverted the religion that came through Moses and had twisted around and had mixed it with the pagan principles. Now then, we come down to the time of modern times comparatively that is called the Protestant Reformation as it has been called and let's see what we find. If you will get the story of the life of Luther, you will find that he saw that by the things that they were doing and the penance that they paying and by indulgences and things like that men could not be set free from their past guilt! And so, he did away with those things. He did away with certain things, my friends, but he never did substitute obedience to God. He took the things that were then being used and by that time they were using real penance — the real original pagan penances of torturing themselves to get remission of past sins, in other words, justification. And like the Apostle Paul, Luther swept that away, but..., unlike the Apostle Paul, he did not teach obedience to God. He just simply thought that all we have to do is avoid the penance and believe and believe only — a dead faith without any works and the other Protestant leaders followed him. And do you know that some of those great original Protestant leaders...and they were great men and they followed the light as they saw it, they were honest men. But, I tell you my friends, men who had been steeped in the customs and traditions of the time could not see all of God's Truth all at once; but what about their followers? Their followers should have seen a little more and accepted it when they did, but they never did — every one of them. They have taken what their leaders had and they have clung to it. And they not accepted anything that has been revealed new, neither have they rejected anything that was in error that they found. One of the great leaders said before he died, that he had only recovered part of the Truth. He had not restored it all and he urged his leaders to continue as he had done — to find new Truth and to expose new error. But they didn't. They continued right on to this day just as he had, they set their little frame around what he had. They wouldn't let any of it get out, they wouldn't have anything else get inside of it. And they kept it there. And that is one of the four or five largest denominations in the Western world today. And that's the way it has been my friends. Now, the thing that differentiates the true Church that Jesus built, that Jesus is the Head of, is that they are doing as Jesus said we should, living by every word of God! They are obedient to God! They look on God as supreme authority. They realize that God has set limitations on the human mind and that we don't know it all and that God's Mind is perfect and that God is a God of Love and that God wants only that for our supreme happiness and our good that God wishes above all things that we might be prosperous and be in health. And that God wants us to enjoy life. But not to do those things that give us a temporary kick and then kick back at us as a boomerang and give us the headaches tomorrow morning — not that kind of pleasures. But the kind that is uplifting, up building and that builds us permanently and makes us more happy. Those are the things of the Law of God that God wants us to live by. Now, obedience to God, living by every Word of God, and how do we do it? God gives us His Laws in His Word the Bible and it gets down to this — regarding the Bible as the supreme authority in your own personal life, in your church life, your business life, everything. Some people say as one...in fact, I think perhaps most religious people and church people would say, "Now, what has religion got to do with my politics or my business life or my social life? That's something separate." Oh no, it isn't my friends. When you come to the Truth of God it is your life. This is your life — the Word of God, the Way of God and you must live by it in your business contacts, in your social contacts, in everything and you should read it to see what your political life should be, if any, and you will get your eyes opened on a lot of things. Today, people say, "Well, I don't see that it makes any difference." Do they tremble before the Word of God? Do they fear it? Do they look on it as an authority? They say, "Well, you know, this is the way I look at it." They aren't concerned at the way God looks at it. They aren't concerned with the Laws that God laid down that are going to judge them in the Judgment day, that are going to determine whether they have eternal life. But they say, "This is the way I look at it." How many are going to really look to God and look to the Bible as supreme authority? You know any that do? Well, my friends, that's what you have to do if you really ever going to, as they say, be saved, if you know what being saved really means and very few do and if you're going to that's what it's going to mean.